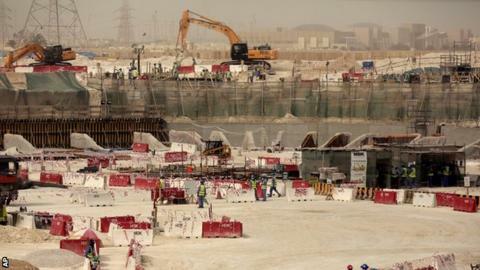 Journalists were arrested and held in Qatar while filming a documentary on conditions facing migrant workers ahead of the World Cup in 2022. A German television crew was held for 14 hours and say their equipment was seized and their recordings wiped. Qatari officials said the arrests in March were made because the TV crew did not have permission to film in the country - not because of the content. Human rights groups have expressed concerns about conditions for workers. The documentary, 'Sold Football - Sepp Blatter and the power of Fifa' by German broadcaster ARD, was screened on Monday. The filmmakers claim they were only allowed to leave the country five days later without their filming equipment, laptops and mobile phones, which were sent on four weeks later with all data deleted. Reporter Florian Bauer said: "Now it's public. We got arrested in Qatar, interrogated by the police and the intelligence service. Not allowed to leave the country for days." A statement from Qatar's Supreme Committee for Delivery and Legacy said: "Any working journalist who has visited Qatar will be aware of this process and understand filming in specific locations without permission runs the risk of legal repercussions."